March 9, 2017 By Allyson 6 Comments This post may contain affiliate links. Read my disclosure policy. 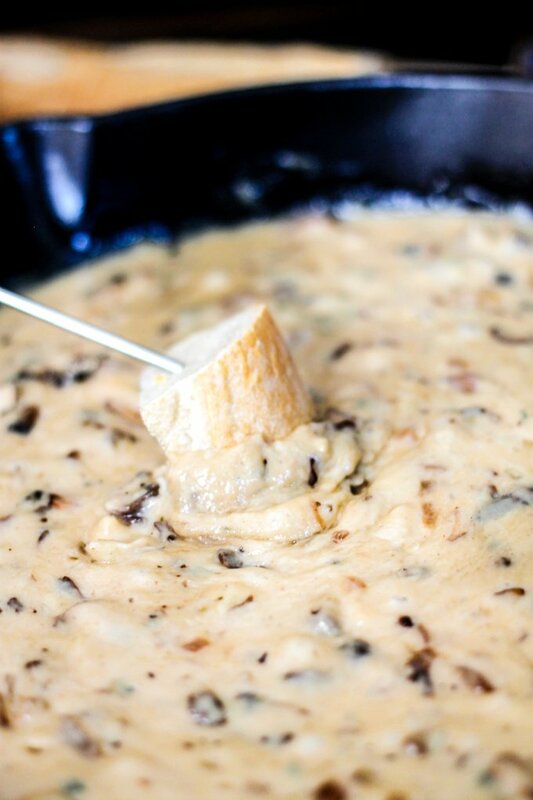 Mushroom Brie Fondue is a perfect blend of three different cheese and delicious mushrooms! This appetizer will not last long! 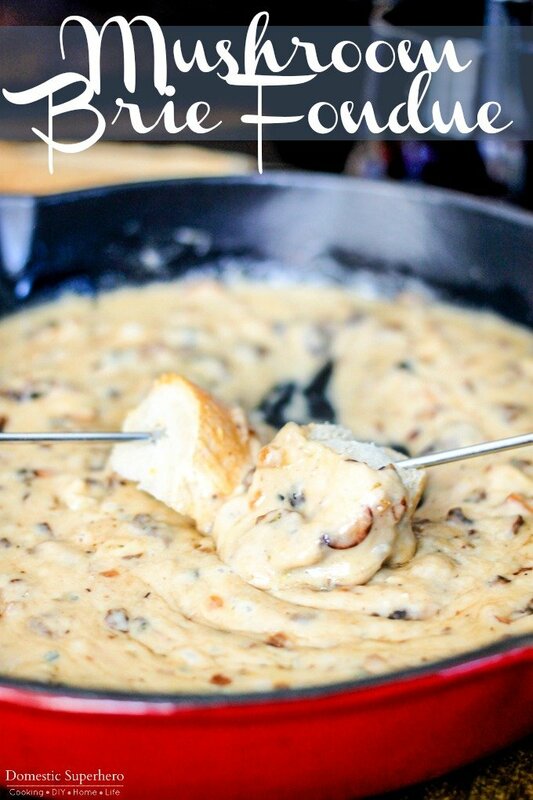 If y’all like cheese, you are going to LOVE this Mushroom Brie Fondue! It’s a blend of delicious brie cheese, blue cheese, Swiss cheese, and sautéed mushrooms. It comes together perfectly for an ooey-gooey appetizer, and pairs wonderfully with Frontera’s Cabernet Sauvignon Merlot Blend. 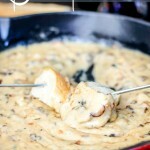 I especially like making this Mushroom Brie Fondue during sporting events or parties! Everyone always loves it and asks for the recipe. If you have a fondue pot, I recommend leaving the fondue in the pot and keeping it warm during your party! 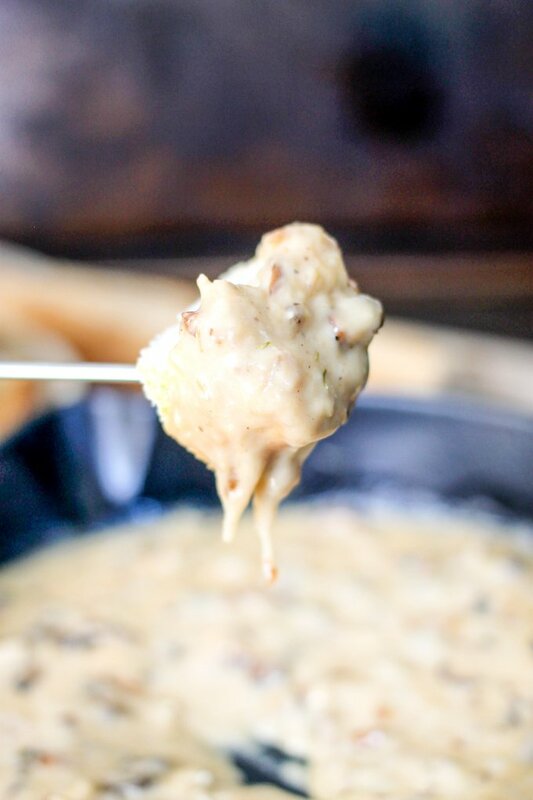 This fondue is easy to whip up…. All you need for this fondue is brie, Swiss cheese, bleu cheese, mushrooms, a shallot, some white wine, thyme, and a crusty loaf of bread. 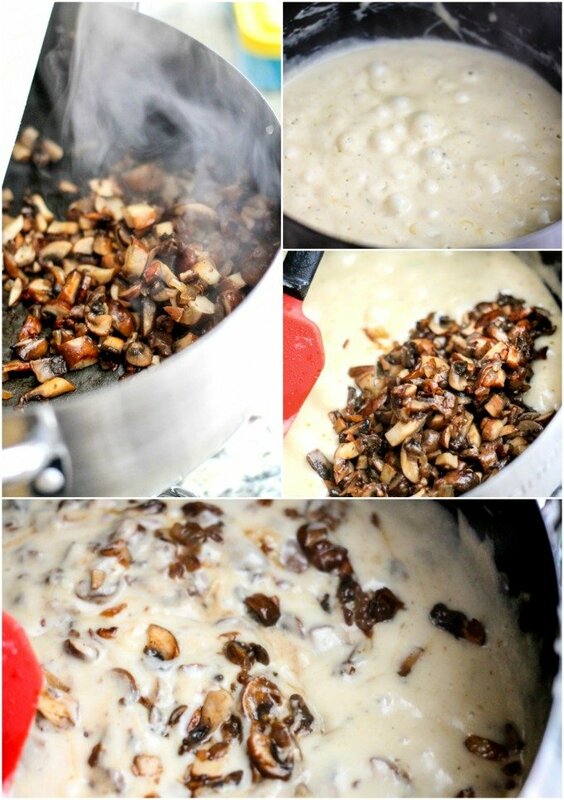 You can sauté your mushrooms and shallot in the fondue pot or skillet and then add your wine and cheese. Let everything get melty and voila, the perfect game day snack! The brie cheese goes well with a medium bodied red wine. Brie is a softer cheese, a bit lighter in flavor, and more in tuned with a subdued red texture. 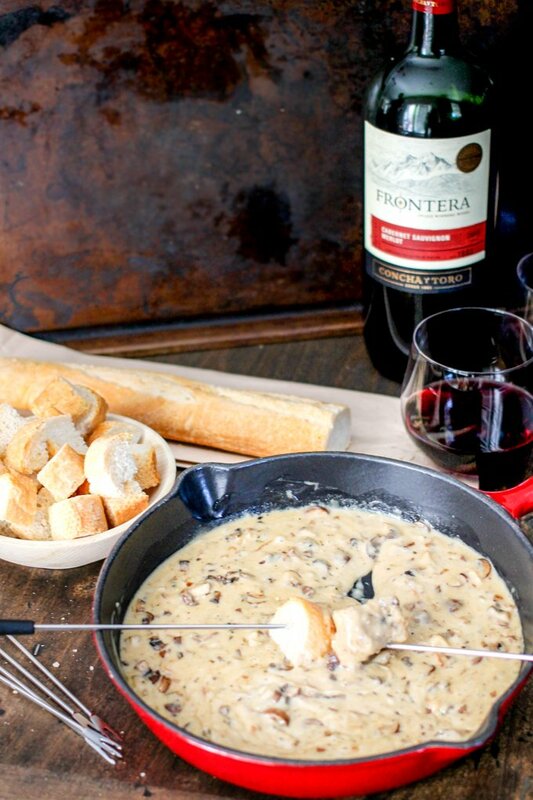 By mixing the brie with Frontera Cabernet Sauvignon Merlot blend, it helps retain the robust flavor of the red grapes. A fondue pot makes this recipe super easy. Sure you don’t absolutely need to have it (can also make in a skillet), but it will help keep your fondue warm during your party! Stemless wine glasses are the perfect way to serve wine at your next party! A serrated knife will not only be helpful for cutting your baguette, but it will also be great for cutting the rind off your wheel of brie cheese. A quality olive oil is important for sautéing your mushrooms and shallots. Using a fondue pot or skillet over medium high heat, add olive oil, mushrooms, and shallots; sauté for 3-5 minutes or until tender. Remove any extra liquid from pot. Add cheeses to a small bowl, and add flour, toss to coat cheese. Add white wine to the pot, bring to a boil. Slowly add the cheese and stir until melted. Add thyme and pepper to taste. Keep on low heat to maintain melted consistency and serve with crust bread slices. Frontera is having a fun Game Day sweepstakes on Facebook right now too! Showcase how you celebrate your favorite team on game day for a chance to win a 55” HD flat screen TV! 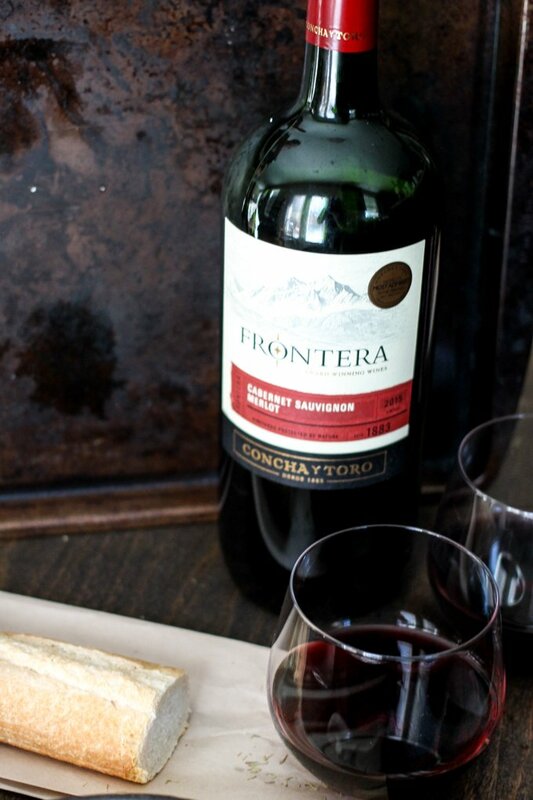 For all kinds of people and tasty moments, choose Frontera wine! Hi! For how many people is this recipe? Have you (or any of your readers) subbed a different cheese for the blue? We are not fans in our household (like, at all). Would you suggest doubling the Swiss or adding a third, different cheese? 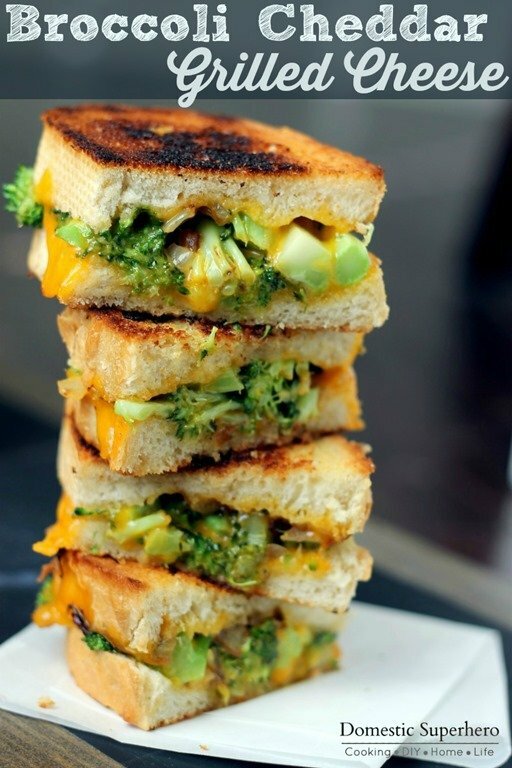 You can definitely leave out the bleu cheese and use another cheese. Swiss, gruyere, fontina, would all be great. When you remove the rind from the Brie, do you just take off the outer ring, or do you take off the top & bottom too? For this recipe I take it all off. You could leave it on, but the rind will not smooth out when melted. It’s tasty though!